love the materials - can you tell me what you have used here? 3. Make it dramatic – and invest in cabinetryThis house near Brisbane by Atelier Chen Hung is a study in steel and timber, with smartly detailed ply cabinetry in contrasting birch and dark plywood, plus nicely mitred cutout handles. 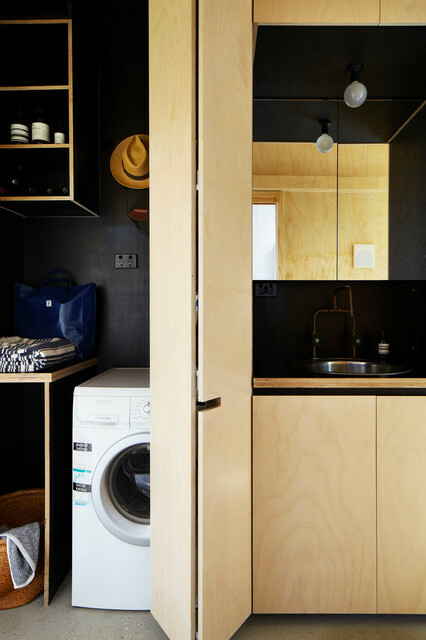 The laundry is no exception; birch surrounds the hand basin on one side, and dark open shelving takes care of the business side. Dark painted walls complete the look. Note the way the handle in the folding door lines up with the negative detail under the benchtop. 19. Location: Brisbane, QueenslandWhy we love it: Warm plywood joinery, contrasting black-painted walls, and little touches such as the folding door handle lining up perfectly with the negative detail under the benchtop – proof that even the most practical areas of the home can benefit from an injection of style.